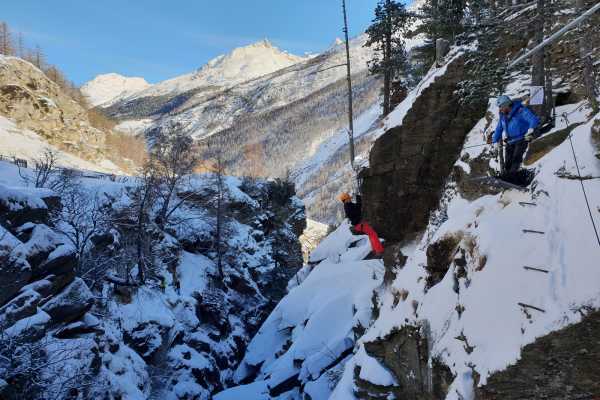 This spectacular tour from Saas-Fee to Saas Grund is by far the most beautiful and thrilling way of connecting the two villages. The trail passes through natural canyons, caves, water falls and alpine vegetation. In addition, you will experience zip lines, suspension bridges and pendulum swings with one rappel at the end of the tour. For hundreds of years people only dared glimpse into the depth of the Saaser Vispa canyon. Nowadays we glide down its center via iron cables, pegs and ladders. While perhaps being intimidating at the start, butterfly-filled stomachs and wobbly knees will give way to smiles and screams of triumph while overcoming the forces of gravity through natural terrain. The canyon adventure is the event for groups, clubs and families. + Easy tour + No special fitness requirements Winter Tour (lower part) Duration 2-3h Group Tour When on request Price CHF 90.- per person (min. 4 / max. 7 pers.) Private Tour When on request Price CHF 340.- (1 - 3 pers.) Summer Tour (May to December) Duration 3-4h Group Tour When on request Price CHF 120.- per person (min. 4 / max. 7 pers.) Private Tour When on request Price CHF 450.- (1 - 3 pers.) Equipment included: All participants are provided with helmet, climbing harness and via ferrata equipment.